Los Angeles – The price of gold saw its first weekly gain in the new year after climbing 1.02 percent to $1,348.60 an ounce on Friday as silver rallied almost 6 percent for the week to close at $29.05 an ounce. 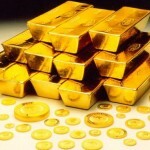 The Gold/Silver ratio (GSR) dropped to 46.42 as the price of silver became more expensive relative to the price of gold. Evidence continued to build last week that both Gold and Silver were establishing a floor to the downside. As supporting evidence, both bullish sentiment and the commitment of traders (COT) report were at levels most often seen at important bottoms. In the physical market, there is enough buying interest from buyers in Asia to keep premiums for gold bars steady at their highest levels in at least seven years in both Singapore and Hong Kong. The turmoil in Egypt was spreading to other regions and negatively impacting economic growth while contributing to higher consumer prices according to Nouriel Roubini, chairman of Roubini Global Economics. Rising food and fuel prices have already hit the poorer countries and are one of the major factors driving the massive anti-government protests in Egypt and in Tunisia, where president Ben Ali was ousted just last month. The rising casualties in Egypt kept investors on edge last week, driving Brent crude oil to a 28 month high above $103 a barrel and pressuring equities. World leaders from France, Germany, Great Britain, Italy and Spain, echoing President Obama’s recent remarks, told Egyptian leaders that the transition process to a broad based government “must start now.” The joint statement released by French President Nicolas Sarkozy’s office, said the leaders were following the escalating violence in Egypt with “extreme concern.” Economic and geopolitical uncertainty in Egypt together with the possibility that unrest will spread throughout the Middle East and North Africa are leading to an increase in safe haven buying of physical gold. Fed Chairman Ben Bernanke on Thursday said that despite recent signs of improvement in the U.S. economy, the recovery still needs help from the Fed. “Although economic growth will probably increase this year, we expect the unemployment rate to remain stubbornly above, and inflation to remain stubbornly below, the levels that Federal Reserve policymakers have judged to be consistent over the longer term with our mandate,” he said. After the release of the nonfarm payroll data on Friday that showed only 36,000 new jobs were created in January you can make the case that QE3 may be on the Feds agenda after the QE2 provision ends in June.